The church: St Paul's, K Street, Washington, DC. Denomination: The Episcopal Church, Diocese of Washington. The building: A beautiful cruciform stone church, actually smaller than I had imagined, in the Georgetown district of Washington. 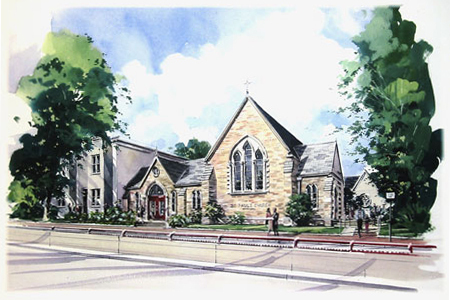 The congregation was founded in 1866 and worshiped at its original church until 1944, when they engaged the architect Philip H. Frohman (principal architect of Washington National Cathedral) to design a new building. The first service was held in the new church in June of 1948, but it was not consecrated until 1966. There is a spectacular chapel dedicated to Our Lady of Walsingham, and a reredos that (I was told) simply must be seen to be believed. Unfortunately, it couldn't be seen, as it was draped for Lent. I might have peeked, though. The church: This is one of America's premier Anglo-Catholic churches. On Christmas Eve 1870, the first midnight mass to be celebrated in an Anglican church anywhere in the USA was celebrated at St Paul's. St Paul's was also one of the first churches to use envelopes for the offering. Both low and high mass are celebrated each Sunday, along with solemn evensong and benediction. Morning and evening low mass are celebrated each weekday, and confessions are heard Wednesday and Saturday evenings. St Paul's is noted for its particular tradition for church music. The neighborhood: Georgetown was founded in 1751 and was not assimilated into the District of Columbia until 120 years later. Originally one of the most fashionable neighborhoods of Washington, the area slid into decline around the beginning of the 20th century. It quickly recovered, though, as members of President Franklin D. Roosevelt's administration bought and renovated many of the stately old townhouses there, and reached its zenith when Georgetown resident John F. Kennedy was elected president. Today Georgetown is one of the most affluent and upscale neighborhoods in Washington, with many politicians and lobbyists making their homes there. It is also known for its throbbing nightlife, attracting students from Georgetown University as well as tourists, professionals, Capitol Hill types and dignitaries. St Paul's Church directly abuts George Washington University and is located near the popular Washington Harbor complex on the Potomac River, featuring many outdoor bars and restaurants. The cast: The Revd Andrew L. Sloane, rector; the Revd Nathan J. A. Humphrey, curate; and a cast of characters that would fill a screen. The date & time: March 9, 2008, 11.15am. As I walked through the door at about the last possible moment (missed the subway train, you see), I dashed past the usher and had to go back and get the appropriate handouts. She was quite nice about it though. Because I was so late and the service had started, she just handed the pamphlet to me quietly. It was a pew of the standard wooden variety. As mentioned above, I was a bit late for the pre-service. They were into the first hymn when I got there. A service leaflet, an in-house missalette (which was not in my pew – I had to steal one from another pew), and the 1982 Hymnal. The church's pipe organ, a large 1996-vintage four-manual opus from the Schoenstein and Company firm of San Francisco. Some major renovation work is taking place inside the church, and there was the thinnest layer of dust on everything, including the pews. A child in front of me was tracing her name in it. This is about as high as high church can get. 7  Father Sloane was humorous yet profound. It was quite the conversational sermon, rather than feeling read from a paper. He projected well (there didn't appear to be a sound system in the building at all) and could be heard throughout the building. The focus was on keeping a holy Lent and the discipline needed to do so. He spent some time discussing the triduum as "one service in three." He also said that Kyrie, usually translated as "Lord," more properly means "Sir." The choir – oh the choir. Angelic voices. Absolutely heavenly. The service leaflet didn't provide very much guidance as to what postures were expected, and when. I did quite a lot of looking around to see what the traditions were at St Paul's, but unfortunately the people immediately in front and beside of me were visitors as well. We were all confused, but at least we were confused together. Mrs Humphrey (the curate's wife) walked up and introduced herself to me. Such a delightful woman! She took a few minutes to speak with me about the parish, and made it clear that I would be welcome back. She noted me peering over a modesty panel to get a look at the organ console, and she stressed how much the church valued their music program. There was none, to my knowledge. 10  If I lived in the District of Columbia, this would definitely be my parish. Father Sloane explaining that Kyrie means "Sir" and putting the readings into that context.